By Michael R. Gordon, Jonathan Cheng, Michael C. Bender, The Wall Street Journal. President Donald Trump will urge North Korea to act quickly to dismantle its nuclear arsenal when he meets North Korean leader Kim Jong Un and isn’t willing to grant Pyongyang substantial sanctions relief in return for a freeze of its nuclear and missile tests, administration officials said. Those two closely related questions—the pace of Pyongyang’s nuclear dismantlement and the timetable for sanctions relief—stand to be the major issues of the summit. “When the president says that he will not make the mistakes of the past, that means the U.S. will not be making substantial concessions, such as lifting sanctions, until North Korea has substantially dismantled its nuclear programs,” a senior Trump administration official said on Sunday. Get a daily guide to the best stories in The Wall Street Journal from Editor in Chief Gerard Baker, delivered right to your inbox. “If North Korea is willing to move quickly to denuclearize, then the sky is the limit. All sorts of good things can happen,” the official added. Mr. Kim announced Saturday after a meeting of the central committee of North Korea’s ruling party that his country would close its nuclear test site and suspend long-range missile tests. The statement has been hailed as an important move to establish a good atmosphere for a summit meeting that is expected to be held outside northeast Asia in late May or June. In a meeting in Pyongyang over the Easter weekend, Mr. Kim tried to push Central Intelligence Agency Director Mike Pompeo toward a phased agreement in which each side would make paired concessions on a timetable that could stretch out for years, according to a person familiar with the matter. But the Trump administration is wary of making economic and diplomatic concessions upfront for steps to dismantle the North Korean arsenal that would only to be taken later. The administration favors what one person called a “big bang” approach, in which major concessions would be made by each side early on. Some experts say there may be ways to make sure that the steps taken during the initial phase cannot be easily reversed. Joel S. Wit, a former State Department official, said officials from the two sides could negotiate procedures that would make the shuttering of North Korea’s nuclear test site irreversible. This might also involve visits by international monitors to the site. Given the decades of enmity between the two sides, Mr. Wit said a phased process to build up trust and confidence before taking ambitious steps is logical. 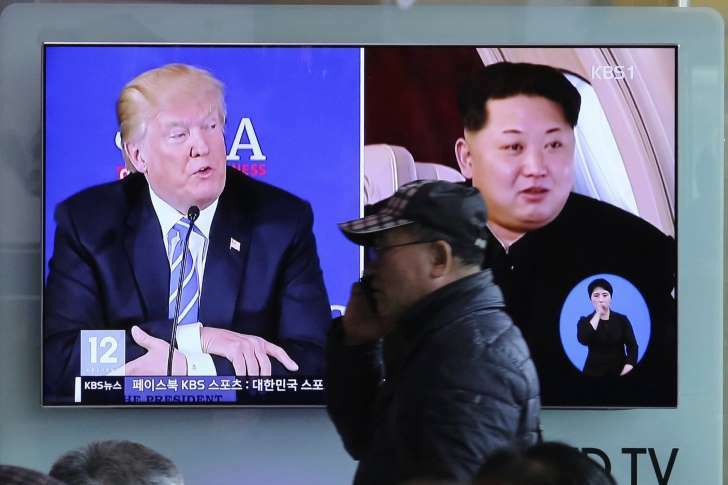 But there is also a widespread perception among officials in Washington that North Korea has used previous rounds of negotiations to pursue economic benefits and sanctions relief without abandoning its nuclear weapons program and agreeing on the difficult question of verification arrangements. North Korean officials have urged a phased approach to denuclearization before. In a meeting in Europe in 2013 with former U.S. officials, North Korean government officials described a three-phase process. The first phase would involve a freeze of the North’s nuclear activities to be followed by a stage in which the Pyongyang’s nuclear programs would be disabled. In the final stage, they would be dismantled. Under the North Korean approach, the U.S. would take reciprocal economic, diplomatic and security steps during each phase. The two sides would spell out the ultimate objectives in a declaration that would be drafted at the start of the process. While a moratorium on missile and nuclear tests would have some security benefits, the administration is seeking a more far-reaching agreement. “They are not going to get the sort of relief from economic sanctions I am sure they are looking for in the absence of dramatic progress in dismantling their programs,” the senior administration official said. Mr. Pompeo’s visit to Pyongyang meant to gauge North Korea’s willingness to abandon its nuclear weapons. Messrs. Pompeo and Kim also discussed the possible release of three U.S. citizens detained in North Korea and the location options for a possible summit of the two leaders, according to people familiar with the trip. Mr. Pompeo’s trip lasted just a day, and he didn’t stay overnight in the city, these people said. Tensions over the pace of denuclearization could have important implications for U.S. allies. The South Korean government could be frustrated if talks falter over a disarmament schedule.